Why only dream of paradise? Selamat datang di Alam Mimpi! Welcome to the Alam Mimpi Resort. 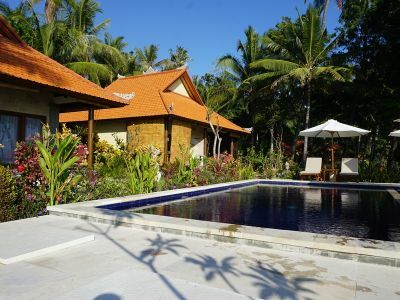 Located on 23 acres of land by the sea in northern Bali in Penuktukan, there are 2 spacious double bungalows with 4 deluxe guest rooms with air conditioning and open-air bath and a separate family room with a double and a single bed. Lift your head in the morning after waking up and enjoy the clear view of the sea! Our cozy restaurant, swimming pool, office and massage area are waiting for you and Made pampers you with balinese delicacies. Or you have an appetite for fresh fish from the grill? Directly in front of Alam Mimpi is the diving area Angels Canyon, gorgeous to dive or snorkel. We also offer diving trips to Tulamben, Padang Bai, Amed, Kubu and Menjangan and non-divers will appreciate the sightseeing, cooking classes and visit the local markets or enjoying our balinese massages. Diving takes place in cooperation with the Karang Divers. The Karang Divers have their base 100m from Alam Mimpi Resort. This base is modern and is under German leadership of Kristina Udo. If you have any question you can contact us by phone or email.